First lines: My Dad! No one could mistake Arnold for a normal human being. Let’s start with the fact that he’s wallpapered our apartment with postcards of Mary. The collection is famous on campus. Visiting luminaries get tours. So does Arnold’s senior seminar. The invasion was gradual, of course, but I imagine it happening it all at once. First lines: Had Miss Lydia Whitfield of Roseberry Hall been of a skittish nature, the sound of a rapidly approaching carriage would have caused considerable anxiety. As it was, the clatter behind her did nothing to stay her steps. Besides, she recognised the bells on Esme’s harness and Turnip’s nicker of protest – poor creature hated to canter. The vehicle could be none other than the family landau. First lines: I was okay until they started my mom’s casket into the ground. Up to that point, the funeral had felt like an out-of-body experience. I walked around inside my own thick-walled aquarium. My motions were slow. My thoughts bogged down. I knew I was on display- everyone craning their necks to catch the slightest ripple of my movement. First lines: Tyler Bennett stood in front of the white marble vanity, staring at the mirror – or rather, what was left of it. A few large shards bristled like teeth from the frame. The rest of the broken glass was scattered across the counter among lipstick tubes, broken eye shadows palettes, and other cosmetics. A woman’s arsenal. First lines: The Magician stood at the edge of his world and took one last look at the city. The spires of churches rose like jagged teeth, and the sightless windows of tumbled buildings flashed in the rising sun. He loved it once. In those lawless streets, a boy could become anything – and he had. But in the end, the city had been nothing but a prison. It had borne him and made him and now it would kill him just the same. First lines: It’s been weeks since the last yard brawl, and the every one of us is twitchy, ready to jump our skins. I check out the scattered pockets of orange jumpsuits under the guard tower, listening as Six screws with the new kid. The concrete walls are smooth, twenty feet high, and looped with razor wire. The guard posted in the tower scans the grounds, his head moving in slow rotations you could set a watch by. My backbone stiffened and pushed me to my full height. First lines: The ice-planet arrived in the dusky heat of summer twilight during the Earth’s Fourth World War. Just when the moon’s jewelled fingers were slipping through that one broken slat in the barn roof that Papa always said he’d fix but never did. The same slat through which he’d pointed out Ella’s favourite star to Sofi and her brother, Shilo. First lines: You don’t know what anger is until you’ve spent time with a mare in a truly foul mood. Shadow is livid. I’ve been back for two days now but she’s still mad at me – and determined to let me know it. Usually I can sense what she’s feeling by intuition. No need for that right now, with the tantrum she’s throwing. Twelve hundred pounds of black mare ripping the earth open with her hooves isn’t exactly tough to read. First lines: I didn’t fit. The night moon glowed overhead, cool and soft and bright. I’d slipped off the dark roof and into the darker room through the window, but my hips had gotten wedged, and try as I might, I couldn’t pull my way through. I was stuck, half in and half out the bedroom before me. Girls Made of Snow and Glass, Melissa Bashardoust. This is described as “Frozen meets The Bloody Chamber” (a short story by acclaimed and slightly-grim author Angela Carter) which is to say it is a nice kind of mash-up retelling of Snow White. “At sixteen, Mina’s mother is dead, her magician father is vicious, and her silent heart has never beat with love for anyone – has never beat at all, in fact, but she’d always thought that fact normal. She never guessed that her father cut out her heart and replaced it with one of glass. When she moves to Whitespring Castle and sees its king for the first time, Mina forms a plan: win the king’s heart with her beauty, become queen, and finally know love. The only catch is that she’ll have to become a stepmother. Fifteen-year-old Lynet looks just like her late mother, and one day she discovers why: a magician created her out of snow in the dead queen’s image, at her father’s order. But despite being the dead queen made flesh, Lynet would rather be like her fierce and regal stepmother, Mina. She gets her wish when her father makes Lynet queen of the southern territories, displacing Mina. Now Mina is starting to look at Lynet with something like hatred, and Lynet must decide what to do—and who to be—to win back the only mother she’s ever known…or else defeat her once and for all…” (supplier database). We like this. An Enchantment of Ravens, Margaret Rogerson. This looks like the author had a lot of fun playing around with the world of faerie. “Isobel is a prodigy portrait artist with a dangerous set of clients: the sinister fair folk, immortal creatures who cannot bake bread, weave cloth, or put a pen to paper without crumbling to dust. They crave human Craft with a terrible thirst, and Isobel’s paintings are highly prized. But when she receives her first royal patron – Rook, the autumn prince – she makes a terrible mistake. She paints mortal sorrow in his eyes – a weakness that could cost him his life. Furious and devastated, Rook spirits her away to the autumnlands to stand trial for her crime. Waylaid by the Wild Hunt’s ghostly hounds, the tainted influence of the Alder King, and hideous monsters risen from barrow mounds, Isobel and Rook depend on one another for survival. Their alliance blossoms into trust, then love – and that love violates the fair folks’ ruthless laws. Now both of their lives are forfeit, unless Isobel can use her skill as an artist to fight the fairy courts. Because secretly, her Craft represents a threat the fair folk have never faced in all the millennia of their unchanging lives: for the first time, her portraits have the power to make them feel” (supplier database). There’s Someone Inside Your House, Stephanie Perkins. “It’s been almost a year since Makani Young came to live with her grandmother in landlocked Nebraska, and she’s still adjusting to her new life. And still haunted by her past in Hawaii. Then, one by one, the students of her small town high school begin to die in a series of gruesome murders, each with increasing and grotesque flair. As the terror grows closer and the hunt intensifies for the killer, Makani will be forced to confront her own dark secrets.” (supplier database). Anyone love a good horror? One Dark Throne, Kendare Blake. The sequel to Three Dark Crowns. “With the unforgettable events of the Quickening behind them and the Ascension Year underway, all bets are off. Katharine, once the weak and feeble sister, is stronger than ever before. Arsinoe, after discovering the truth about her powers, must figure out how to make her secret talent work in her favor without anyone finding out. And Mirabella, once thought to be the strongest sister of all and the certain Queen Crowned, faces attacks like never before – ones that put those around her in danger she can’t seem to prevent” (supplier database). Also keep an eye out for Tower of Dawn, the next Throne of Glass novel by Sarah J. Maas, and Warcross by Marie Lu. Home sewers; get in! This book celebrates the ethics and charms of the homemade garment. We’ve just ordered a bunch of really interesting stuff, including some suspense-filled sci fi action: the end of a popular series, an uncomfortable plot for environmentalists, and a new take on the familiar alone-on-a-spaceship idea. They look interesting! The Loneliest Girl in the Universe, Lauren James. Expected in September. “Can you fall in love with someone you’ve never met, never even spoken to – someone who is light years away? Romy Silvers is the only surviving crew-member of a spaceship travelling to a new planet, on a mission to establish a second home for humanity. Alone in space, she is the loneliest girl in the universe until she hears about a new ship which has launched from Earth – with a single passenger on board. A boy called J. Their only communication is via email – and due to the distance between them, their messages take months to transmit. And yet Romy finds herself falling in love. But what does Romy really know about J? And what do the mysterious messages which have started arriving from Earth really mean? Sometimes, there’s something worse than being alone…” (our library supplier). 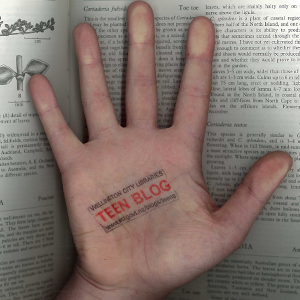 Nexus, Scott Westerfeld, Margo Lanagan, Deborah Biancotti. Expected in November 2017. This is the conclusion to the Zeroes trilogy. “After defeating Swarm in a breath-taking stand-off, Nate has been arrested for his murder. In prison and isolated, he can’t use his powers of influence at all. Flicker, Chizara, Kelsie and Ethan are on the run and in hiding from the FBI who believe the Cambria Five are domestic terrorists. And Agent Phan and the FBI have a secret weapon up their sleeve – a teenager with a superpower that the Zeroes haven’t encountered yet. Meanwhile, Sonia Sonic and her growing band of weird-hunters are tracking inexplicable events across the country – and their investigations lead them to New Orleans during Mardi Gras, where the celebrating crowds promise enormous power to anyone who can channel it. Time is running out for the Zeroes, but they must learn to trust each other again and combine their powers for good – to avert the looming disaster.” (goodreads.com). Unearthed, Amie Kaufman and Meagan Spooner. Expected in January 2018. “When Earth intercepts a message from a long-extinct alien race, it seems like the solution the planet has been waiting for. The Undying’s advanced technology has the potential to undo environmental damage and turn lives around, and Gaia, their former home planet, is a treasure trove waiting to be uncovered. For Jules Addison and his fellow scholars, the discovery of an alien culture offers unprecedented opportunity for study… as long as scavengers like Amelia Radcliffe don’t loot everything first. Mia and Jules’ different reasons for smuggling themselves onto Gaia put them immediately at odds, but after escaping a dangerous confrontation with other scavvers, they form a fragile alliance…” (goodreads.com). If you like books and clothes, you’re probably gonna love this particular book. 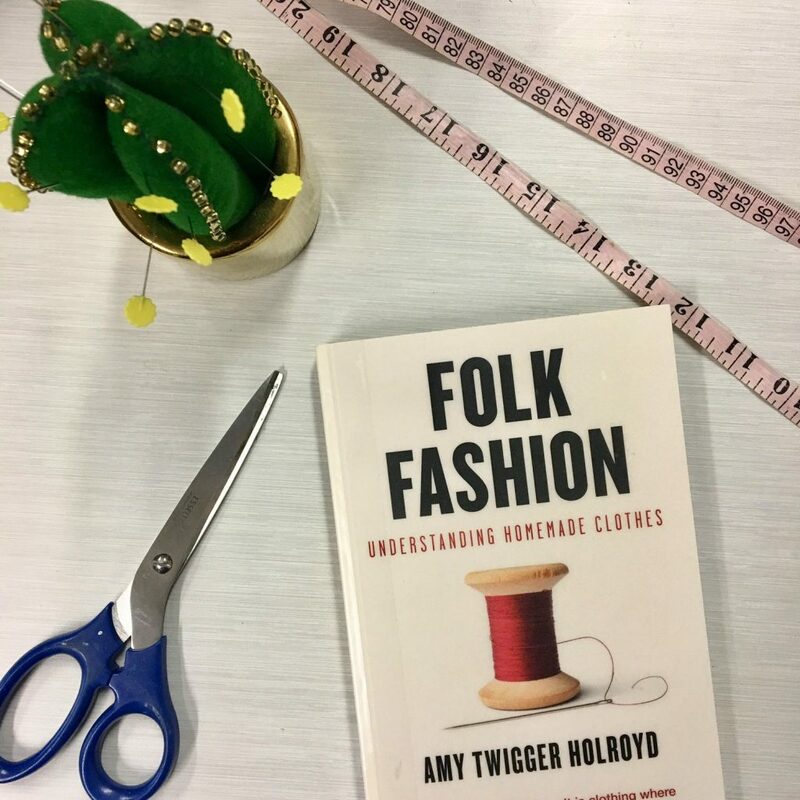 It chronicles the lives and outfits of famous authors including Sylvia Plath, Patti Smith, Oscar Wilde, Zadie Smith and Hunter S Thompson, as well as the ways they write about clothing and fashion (which is way more interesting than it sounds, just fyi). 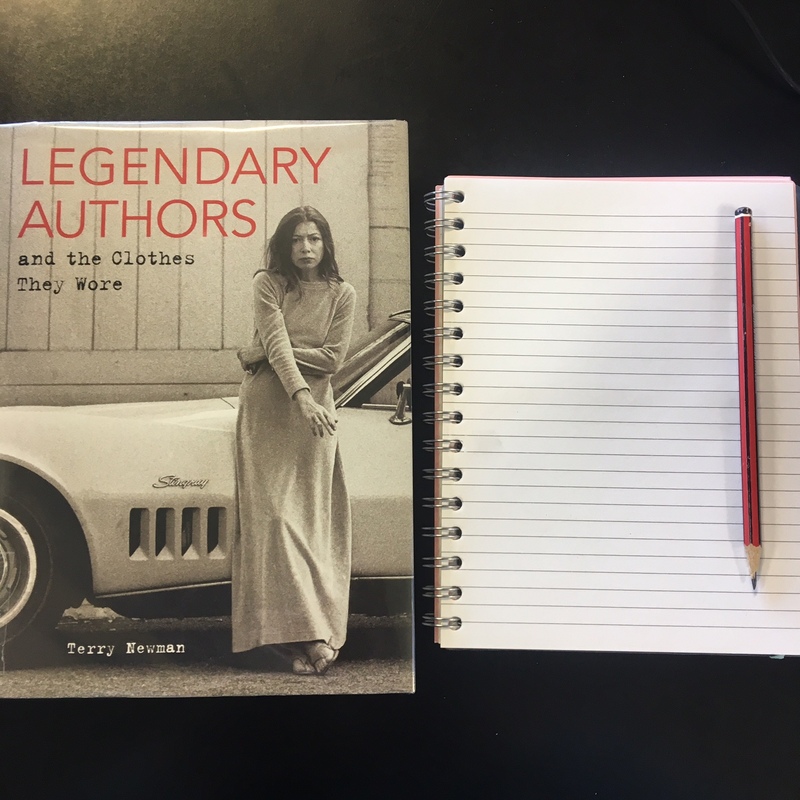 Legendary authors and the clothes they wore / Terry Newman. 09.08.17 | Permalink | Comments Off on More Upcoming YA Fiction! Monster, Michael Grant. Expected Octoberish. Interesting times for fans of the Gone series. This one is set four years after the meteor hit Perdido Beach. “Now the dome is gone and meteors are hitting earth with an even deadlier virus. Humans will mutate into monsters and the whole world will be exposed. As some teens begin to morph into heroes, they will find that others have become dangerously out of control… and that the world is on the brink of a monstrous battle between good and evil” (again, thank you to our suppliers for the info). Grim (but we expect nothing less)! We’ve been waiting a loooooong time for John Green’s next novel, but that wait will soon be over! We’ve also ordered some other cool stuff recently, which we will get to shortly. Turtles All the Way Down, John Green. Expected October 2017. It has been so long since The Fault in our Stars, and we’re really looking forward to this. “Sixteen-year-old Aza never intended to pursue the mystery of fugitive billionaire Russell Pickett, but there’s a hundred thousand dollar reward at stake and her Best and Most Fearless Friend, Daisy, is eager to investigate. So together, they navigate the short distance and broad divides that separate them from Russell Pickett’s son, Davis. Aza is trying. She is trying to be a good daughter, a good friend, a good student, and maybe even a good detective, while also living within the ever-tightening spiral of her own thoughts” (library vendor’s website). This has been so sneakily launched that most people haven’t noticed, and the book cover hasn’t been revealed yet. 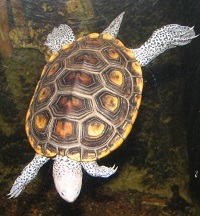 So, in place of a cover we give you a picture of a turtle (well, a terrapin). Why turtles all the way down? What’s a girl to do when her parents have split up; her mum’s trawling Tinder; and one of her best friends has decided not to invite her to the biggest party of the year, which she then has to watch unfold on everyone else’s social media? If you’re a girl called MC, you get mad as hell, that’s what you do. But what begins as one girl’s private, no-holds-barred rant soon snowballs in the most public way possible. (Publisher information). First lines: Yumi’s house was strictly back-door only. The front door was for electricians, plumbers, and religious freaks rummaging in the shrubs for converts. It meant someone inside the house had to get up from what they were doing to let you in. The back door required no more heavy lifting than an arm raised in a wave. The back door was friendlier. Which is why I always went through it. We all love someone. We all fear something. Sometimes they live right next door – or even closer. Kane will do everything he can to save his mother and his little brother Sam from the violence of his father, even if it means becoming a monster himself. Mrs Aslan will protect the boys no matter what – even though her own family is in pieces. Ada wants love that she can count on, while she faces new questions about herself. Mr Bailey is afraid of the refugees next door, not knowing that his worst fear will strike in another form. And Gugulethu is just trying to make a life away from terror. On this street, everyone comes from different places, but to find peace they will have to discover what unites them. (Publisher information). First lines: The lamb roast looked like a giant fist. Sam eyeballed it. He sat at the dinner table sniffing the air. Grace, tough and wise, has nearly given up on wishes, thanks to a childhood spent with her unpredictable, drinks-too-much mother Maggie. Then Grace meets Eva, a girl who believes in dreams despite her own difficult circumstances. One fateful evening Eva climbs through a window in Grace’s room, setting off a chain of stolen nights on the beach. When Eva tells Grace that she likes girls, Grace’s world opens up and she begins to believe in happiness again. When Grace must choose between Maggie and Eva, will she give up the future for the life she has? (Publisher information). First lines: She waits until we’re driving over the bridge to tell. This is a strategic move. Wait until your temperamental daughter is suspended over the Atlantic Ocean to drop the bomb, thereby decreasing the chance that she’ll fling open the car door and hurl herself over the edge. First lines: There was a boy in the lake. At first, I thought he was my brother, but then I realised he was way to big to be a ten year old boy. Even in my mind my brother will never get any older. That’s scary. isn’t it? To realise you’ve lived a whole eight years longer than your older brother ever could. First lines: I realised in the fourth inning that I hadn’t given up a hit yet. The whispers of a no-hitter started when I headed for the mound to pitch the sixth. You think she can do it? I bet she’s going to do it. Has anyone at school ever done that? No, not ever. Robyn Greene searches for the ancient gene that is supposed to enable humans to communicate with animals. After years of failure, she’s beginning to wonder if the gene is a myth. But when she stumbles across a strange genetic mutation, Robyn’s world turns upside down. The man posing as her boss is, in fact, an operative of the mysterious international organisation, MRI. Worse, they have dark plans to exploit her discovery. In a race against time, Robyn must track down individuals with this rare gene before the MRI turns them into lab rats (Publisher information).